I really had high hopes for this book. When I discovered that this book was coming out some time last year, I was both disappointed and intrigued. This book appealed to me because I had this deep desire to write about a woman who could control sound. Sound is a sensitive topic for me and I get very passionate about those around me who are abusive with sound. I guess I still can continue to do so. This book is not about being able to control sound. The story is about a young lady regaining her hearing among a village of people who have all lost their hearing. She goes on a quest to find answers and to save the people in her village. I just didn’t enjoy this one like I thought I would. The ending was very slow. Turning the pages became harder and harder toward the end of the book. I probably should have given it a 2 out of 5 stars. But, I gave this book 3 stars out of 5 because it just didn’t have a strong story to go along with the hype. It took me almost a month to read this book and it’s only two hundred and something pages. It may have something to do with me and my inability to read fast especially when I’m not into the story. Rated: 3 out of 5 stars. Kali Tenee’s “Sky Shore Sea” fixed a lot of issues non-poetry readers have with reading poetry. Tenee’ took away the apprehension, the frustration I often experience while reading poetry trying to figure out the mindset of the author and what is trying to be conveyed. Tenee’ guides you through her world, her mind, and thought process. By entering storytelling, brief descriptions, moments of nostalgia, and synopsizes in between the poems throughout, it helped me get to know the author and the author’s intentions. It also allowed me time to reflect on the previous poem consumed while preparing me for the next poetic meal. The rhythm was much like a song, the fading and gradual building of a song, the push and pull of the tide’s flow. The poem comes crashing to the shore and the drawback is the set up for the next one (score), seamlessly. She guided me through, weaving together one journey with the next connecting their relevance; therefore, I was never left dangling. ‘Shore’ touches on the art of touch, body, silence, and the loss of youthful love. It is here where I had to pause to write down my own personal thoughts. I respect the vulnerability of “lost petals”, the bravery of “you make me wanna” and “all I want,” and the beautiful transparency of “scared of lonely,” “a pressed flower,” and “with you.” Also, in this section Tenee’ tackles the gloomy silence and loneliness of aging. In the ‘Sea’ section, Tenee’ delves in a lot deeper to unearth and display the different kinds of love. Somehow at the end of this section I was able to understand the type of love I want. Often we need to know the love we don’t want in order to know the love we want. “They do[n’t] love you” speaks on conflicting feelings in the joy of helping someone realize their need for love, yet not finding it where they received the clarity. “Crazy deep,“ “first, last,” and “more than” exhibits how the proclamation of love can be so empowering, not merely grandiose fantasies. After reading these poems, I had no choice but to follow suit and proclaim my own needs concerning love. I loved how “Sea” took me on a journey of attempting to measure an immeasurable love. I enjoyed the overall one-woman play feel of her poetry book. I imagined the author on stage reading her poems and the descriptions in between were acted out dramatically, which is similar to Daniel Beaty. He tells captivating heart-wrenching stories and strategically sprinkles his poetry throughout. I really found it refreshing how Ms. Kali Tenee’ grab my hand and took me on a walk to witness her beautiful transparency and bravery. I can’t wait for more walks with Tenee’ in her psyche. 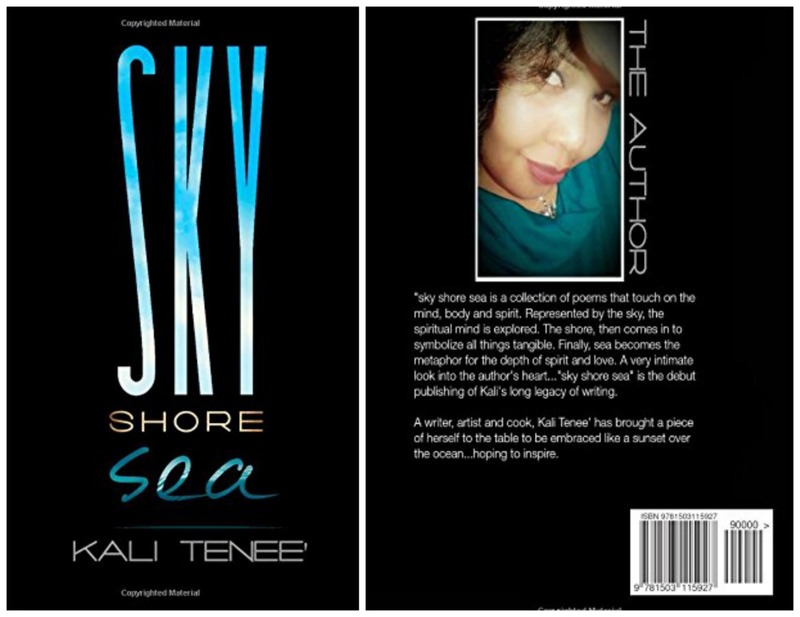 “Sky Shore Sea” can be purchased at createspace.com and amazon.com.